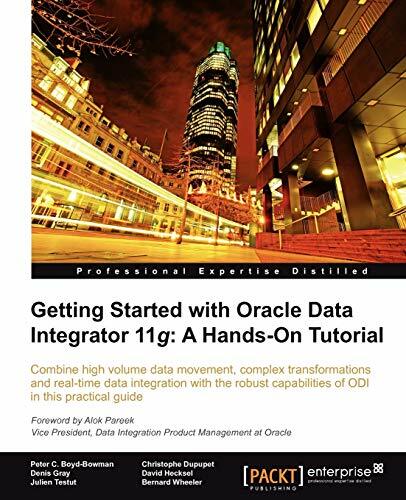 Getting Started with Oracle Data Integrator 11g: A Hands-On Tutorial is a practical tutorial bursting with tips, illustrations and real-world best practices to get you on your way with ODI. If you are a software/ETL developer or database administrator who is new to Oracle Data Integrator but want to get hands-on with the product quickly, then Getting Started with Oracle Data Integrator 11g: A Hands-On Tutorial is for you. You should have some experience with databases, SQL and ETL technologies. David Hecksel is a Principal Data Integration Architect at Oracle. Residing in Dallas Texas, David joined Oracle in 2006 as a pre-sales Architect for Oracle Fusion Middleware. Six months after joining, David volunteered to add pre-sales coverage for a recently acquired product called Oracle Data Integrator and the rest (including the writing of this book) has been a labor of love working with a platform and solution that simultaneously provides phenomenal user productivity and system performance gains to the traditionally separate IT career realms of Data Warehousing, Service Oriented Architects, and Business Intelligence developers. Before joining Oracle, David spent six years with Sun Microsystems in their Sun Java Center, was CTO for 4 years at Axtive Software architecting and developing several one-to-one marketing and web personalization platforms such as e.Monogram. In 1997, David also invented, architected, developed, and marketed online the award-winning JCertify product - the industry's first electronic delivery of study content and exam simulation for the Certified Java Programmer exam. Prior to Axtive Software, David was with IBM for 12 years as a software developer working on operating system, storage management, and networking software products. David holds a BS Computer Science degree from the University of Wisconsin-Madison and a Masters of Business Administration from Duke University. Bernard Wheeler is a Customer Solutions Director at Oracle in the UK, where he has a focus on Information Management. He has been at Oracle since 2005, working in pre-sales technical roles covering Business Process Management, SOA, and Data Integration technologies and solutions. Before joining Oracle, Bernard held various pre-sales, consulting, and marketing positions with vendors such as Sun Microsystems, Forte Software, Borland, and Sybase as well as working for a number of systems integrators. Bernard holds an Engineering degree from Cambridge University. Peter C. Boyd-Bowman is a Technical Manager and Consultant with the Oracle Corporation. He has over 30 years of software engineering and database management experience, including 12 years of focused interest in data warehousing and business intelligence. Capitalizing on his extensive background in Oracle database technologies dating back to 1985, he has spent recent years specializing in data migration. After many successful project implementations using Oracle Warehouse Builder and shortly after Oracle's acquisition of the Sunopsis Corporation, he switched his area of focus over to Oracle's flagship ETL product: Oracle Data Integrator. Peter holds a BS degree in Industrial Management and Computer Science from Purdue University and currently resides in North Carolina.